Brussels sprouts were not my friends when I was a kid. They always showed up unexpectedly, unannounced and taking up way too much space on the dinner plate with their hateful ultimatum – “No leaving the table until your plate is clean.” The worst part was the soggy, slightly slimy texture combined with the sulfurous, earthy, somewhat metallic taste from steaming. Fast forward 30 odd years and after learning to cook, garden and eat healthy and tasty foods I’ve started to warm up to Brussels sprouts a bit more. I’m not having them twice a week or anything, but I’ve learned how to cook them a couple of ways that make them surprisingly tasty. This recipe is the first one that I tried where I really liked them, the other is Roasted Brussels Sprouts with Maple-Dijon Dressing which is completely unexpected but thoroughly delicious. That is a more sophisticated approach, this is rustic, simple and hugely satisfying. 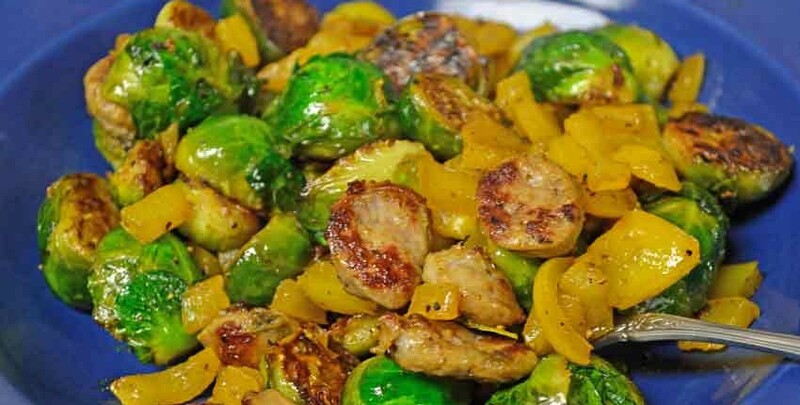 I’ve used this recipe to re-introduce others to an entirely different Brussels sprout than we all knew and hated as kids. 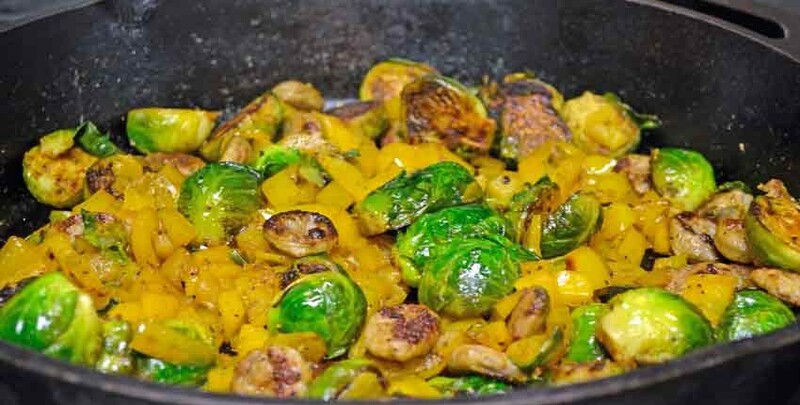 Take the time to properly roast the Brussels sprouts – in a cast-iron deep skillet is the absolute best way as the even heat caramelizes the sprouts, making them nutty, rich and very flavorful. Roasting opens up the flavors that are otherwise locked away and missed. 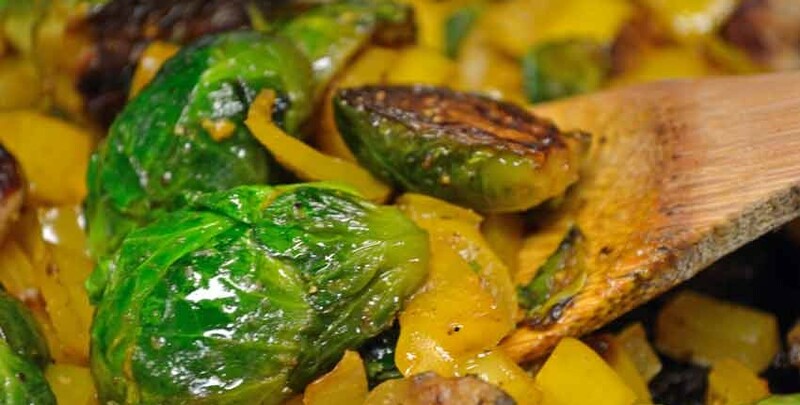 Slow pan-roasting brings out the rich, nutty flavors of fresh Brussels sprouts. 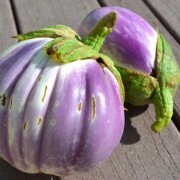 Combined with sweet pepper, onion and sausage, this will make a very satisfying one-course meal or a hearty side dish. 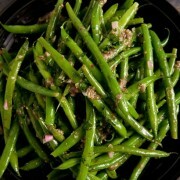 Serves 6 as a side dish or 4 as a one-course meal. 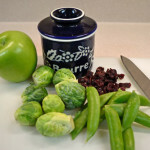 Heat cast iron skillet over low to medium heat, add halved Brussels sprouts, making sure they are all cut side down. Add enough olive oil to lightly coat the bottom of the pan. Check every few minutes by slightly lifting a sprout to check the progress of the caramelization, about 15 - 20 minutes. Add a drizzle of olive oil if sprouts start to stick to pan. 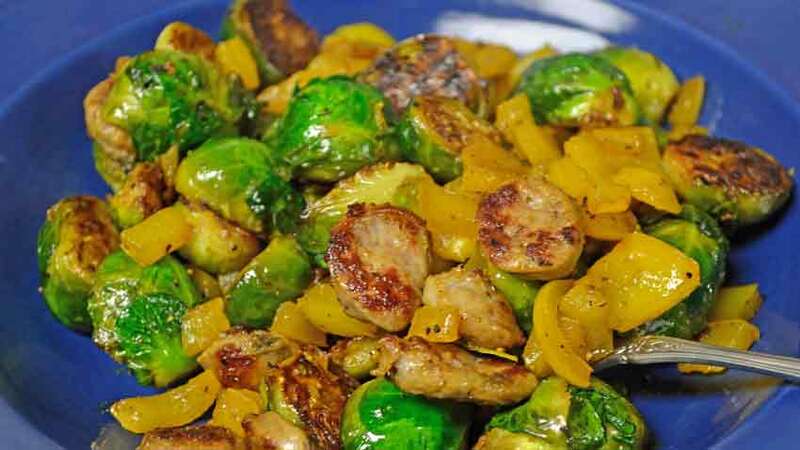 Once the Brussels sprouts have started to caramelize, add the sausage and stir to cook - about 5 minutes. When the sausage is beginning to brown, add onions, bell pepper and garlic. Stir to cook evenly, about 5 minutes. 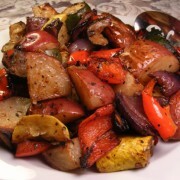 Add a generous splash of balsamic vinegar and stir to coat vegetables. Add salt and ground pepper to taste. 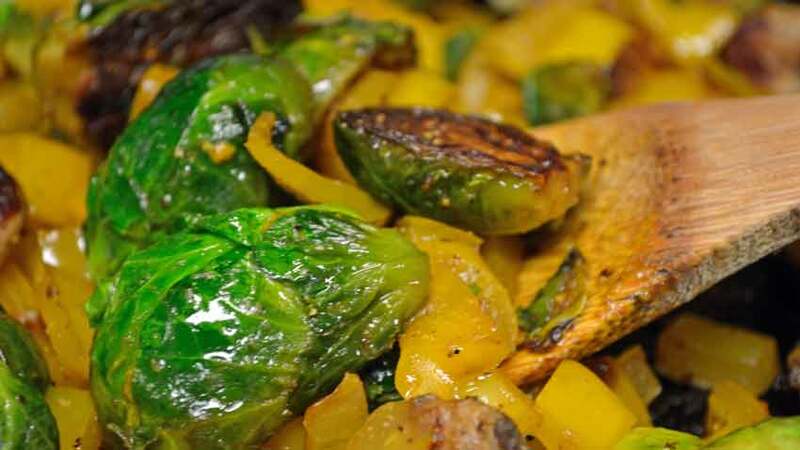 A good caramelization will have some dark spots on the Brussels sprouts, but don't worry - it adds to the flavor! 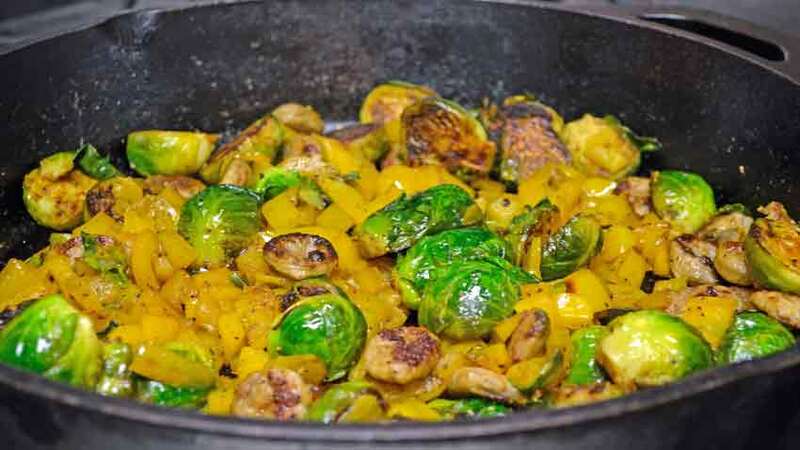 The hardest part of this dish is caramelizing the Brussels sprouts – which isn’t that difficult, just requiring a bit of patience. 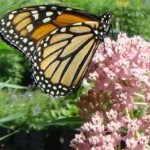 Allow time to let them slowly brown. 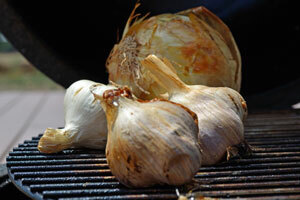 Here’s what the caramelizing looks like… no they aren’t burned, but you don’t want to go much darker than this! 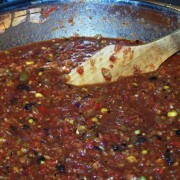 The slow caramelizing adds an unexpected nuttiness and depth of flavor. A closer view of what they look like when almost done. They will be slightly firm but not crunchy, yet a long way from limp and slimy! On to the plate and ready for a feast! Sounds good. But I would cook that sausage longer! One of my favorites is simply to fry bacon pieces, add onion, then put the sprouts in last and cook covered until browned. Please, cook the sausage until you are comfortable! 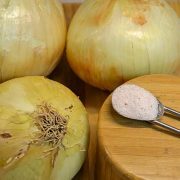 This recipe will have it cooking for 10 – 15 minutes, which when sliced moderately thin will be plenty to cook it thoroughly. Some folks slice their sausages thicker, and will need longer to cook. But yes, adjust accordingly and enjoy. Your version sounds great with the bacon!